A street artist named Tempt One had been completely paralyzed from head to toe due to ALS, the nerve disease better known as Lou Gehrig’s disease. He couldn’t move, talk or even breathe without assistance, let alone create art. His only form of communication was blinking his eye, a time-consuming and frustrating process for him and his loved ones. Mick Ebeling, who had been raised in a family of entrepreneurs and philanthropists and had caught both bugs himself, wanted to help. So first he got Tempt a communication device, like Stephen Hawking uses. EyeWriterBut that still didn’t let Tempt use his creativity, so then Ebeling put together a team of collaborators who built an invention, the EyeWriter, that allowed Tempt to create art again. It’s powered by laser-tag software, developed by Graffiti Research Lab, which tracks eye movements. Ebeling and his team fitted Tempt with the device in his hospital bed, and then watched in awe as he used the Eyewriter to create a large-scale piece of art projected into the parking lot outside. 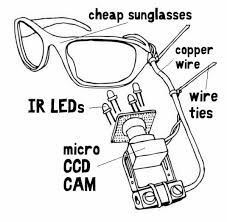 The eye-tracking device is open source and inexpensive to build. Instructions and software are available for free, and the invention allows anyone in the same circumstance to draw or write. From this Genesis, Ebeling founded the Not Impossible Foundation, a nonprofit that develops creative solutions to real-world problems. It’s comprised of thinkers, dreamers and doers, and their mission is to turn what once seemed impossible into a possibility — by connecting and empowering the right people. He also created Not Impossible Labs, where those with important causes get matched with those who can make inventions a reality. He is also the founder of The Ebeling Group, an international production company and creative think tank that represents some of the world’s top design and directing collectives.